Interview thank you letters are an important part of the job interview process. Thank you for interview letters make a positive impression on the employer. Most career planning experts believe sending an after interview thank you letter is a must. Research shows that less than 10 percent of job seekers perform the simple act of giving a thank you letter following an interview. Writing a thank you letter after an interview reinforces your desire to get the job. A simple thank you after an interview can mean the difference between getting a job and continuing to look for a job! Besides reminding the employer that you are interested in the job, an effective thank you letter for interview accomplishes the following. Demonstrates your gratitude to the employer for the job interview. Shows professional courtesy and awareness in writing a job thank you letter. Opportunity to refresh or review with the interviewer why you are the best candidate for the position. This is the time to mention anything about your qualifications you may have forgotten in the interview. Answer any additional job interview questions the employer may have. Any date and time that you agreed with the interviewer to follow up. A thank you letter for an interview should be sent after every interview. The interviewer will usually tell you toward the end of how the company will proceed in following up with job applicants and when they can expect to hear from them. If for some reason they do not tell, and you forgot to ask use the thank you for the interview letter to ask. Send a polite email or try to call the person who interviewed you if several days go by and you have not heard anything. A courteous inquiry sends a strong message that you are still interested in the position. If you were interviewed by more than one person, send each one a thank you after interview letter. Train yourself to say thank you with every contact, whether by phone, face to face, letter or email. Briefly mention the position you interviewed for, date and time. Address the job thank you letters to the individual(s) by title and name. Again, always write and send a thank you after an interview letter within a day of the interview. Spell and match the correct titles to the individual(s) that you interviewed with. Use correct grammar and check for typos. An interview follow up letter can be delivered by hand, an informal note, email, or formal thank you letter. Choosing which form of saying thank you will depend on the situation and what will be most effective. Do you know someone that should understand what interview thank you letters are all about? If so then TELL A FRIEND about this page below. A well written follow up interview letter keeps your name and face ahead of the competition for the job! Every job seeker who wants a job must understand the importance of a thank you letter after an interview. Follow this link to my sample thank you letters page. The easiest way to learn more about Interview Thank You Letters, is to simply enter your search term into the Google search box below. 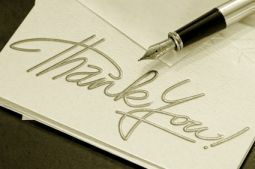 Likewise interview thank you notes that are thoughtfully written can achieve the same result as a thank you letter. A job interview thank you note is usually shorter than a thank you letter. Check out my thank you note samples page.